Hercules has unveiled its new entry-level mixing console for computers, the Hercules DJControl Instinct. This lightweight unit, which is bundled with DJUCED software, features 2 audio outputs and is ideal for new DJs who are ready to plug and play. The DJControl Instinct features bright orange and red backlighting for its controls, which allows users to easily identify where all of the different elements are, even in low-light conditions. The unit’s two pressure-detecting jog wheels mean that DJs can scratch without any latency, as well as scroll within tracks and control the Pitch Bend function. 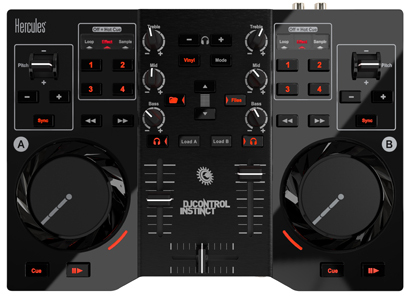 Compact and lightweight, the DJControl Instinct has been created with all users in mind, and comes equipped with everything DJs need to get started: audio outputs, pressure-detecting jog wheels, and intuitive mixing software. All users need is a computer (PC or Mac, with a USB port to connect the controller), a pair of amplified speakers, headphones, and audio files on the computer. The controller and its bundled software, DJUCED, are a perfect match for helping to get budding DJs started with mixing. DJUCED not only instantly displays the beats in music tracks, along with the track lengths, but also indicates which songs match best for the next track to be played. DJUCED even ensures that transitions between tracks stay on time/tempo with the adjustable pitch and auto-sync functions. Designed for creativity, the DJControl Instinct also allows customisation of mixes with effects, loops, samples and Hot Cue points. Incredibly at this price point, the DJControl Instinct features a built-in sound card offering a pair of RCA outputs plus one 3.5mm stereo mini-jack output. This makes it easy for aspiring DJs to play their mix on an amplified PA system, on a hi-fi system or even on multimedia speakers. Meanwhile, the independent 3.5mm stereo mini-jack also lets users connect their headphones, to preview tracks privately before playing them in their mix. Three years after the release of the Hercules DJ Control MP3 e2, the DJControl Instinct now offers an affordable chance to start DJing and provides even better performance, with controls that are more versatile and more comfortable, and overall more complete thanks to the built-in audio outputs. The Hercules DJControl Instinct is a great, compact unit which weighs in at less than 1 kg and measures just 19 x 26.5cm. The unit is available now with a suggested retail price of just £89.99.